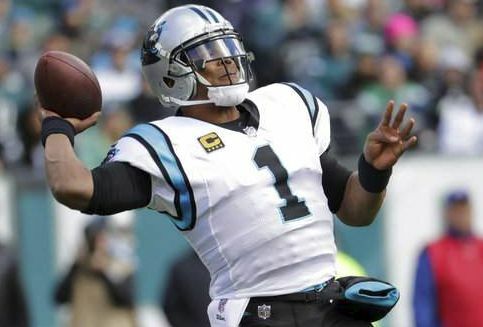 PHILADELPHIA - Cam Newton tossed a 1-yard touchdown pass to Greg Olsen with 1:22 left and the Carolina Panthers overcame a 17-point deficit in the fourth quarter to beat the Philadelphia Eagles 21-17 on Sunday. Wes Horton sacked Carson Wentz, forcing a fumble on fourth down from the Panthers 14, to seal the victory. The Panthers improved to 4-2 with the biggest comeback in franchise history. The defending Super Bowl champion Eagles fell to 3-4. Cam Newton completed the comeback on a one-yard touchdown pass to Greg Olsen. PHILADELPHIA - Cam Newton tossed a 1-yard touchdown pass to Greg Olsen with 1:22 left and the Carolina Panthers overcame a 17-point deficit in the fourth quarter to beat the Philadelphia Eagles 21-17 on Sunday. Wes Horton sacked Carson Wentz, forcing a fumble on fourth down from the Panthers 14 to seal the victory. The Panthers improved to 4-2 with the biggest comeback in franchise history. The defending Super Bowl champion Eagles fell to 3-4.